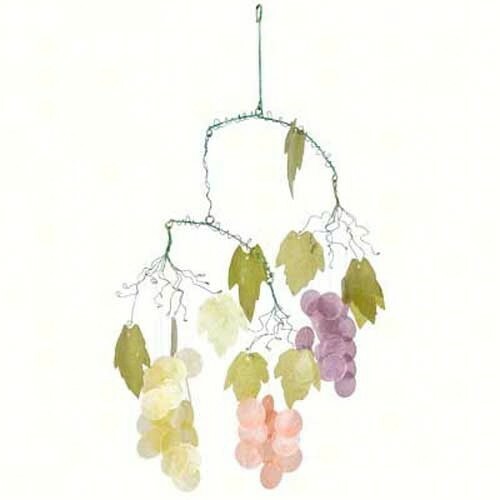 Sip some wine and gaze at delicate grape clusters on this sparkling wine lovers wind chime. The perfect gift for the wine lover or non wine lover for that matter. Three delicate grape clusters grace this mobile-like chime. Each cluster is distinctive; with purple, green and coral color round capiz representing different grape varieties. The leaves are also capiz, and green steel wires create the plants stems. When the wind blows, the capiz create a sparkling, musical arrangement.